Catalyft® offers a Business Coaching Certification Program that includes a proven business model and powerful financial model. Catalyft® offers a Business Coaching Certification Program that includes a proven business model and powerful financial model. 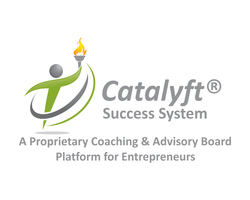 Men & women across the US are getting certified with Catalyft® to lead Peer Advisory Boards and provide Business Coaching and Courses to Small Business Owners and Solopreneurs to experience extraordinary success in business & life. The Catalyft® training program offers extensive hands-on training and support, and a turn key system to attract new clients, develop recurring income, maximize the lifetime value of a client, all while having the freedom to set your own schedule. Have you worked with Catalyft? Tell your friends! Catalyft doesn't have any reviews yet. Catalyft hasn't submitted any articles.